It looked like another dry winter. 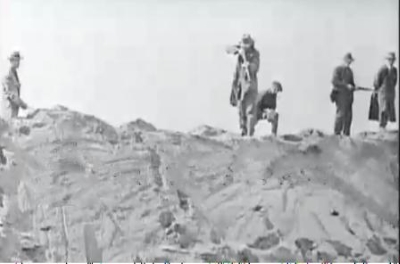 Even as late as January 1924 the grassy hills in Contra Costa remained yellow and brown. The dairy men and ranchers in Contra Costa were nervous. Streams began to run dry. Even more worrisome, only a dusting of snow coated the Sierra Nevada peaks. The Sacramento River was the lowest that had ever been seen. The specter of drought was very real. Although there was some manufacturing, refining and fishing industries that hugged the edges of the bay and river, Contra Costa economy was primarily agricultural and its land nearly empty. In 1924 its total population was barely 54,000. In February the rains finally came. The hills began to green. The cattlemen heaved a premature sigh of relief. They could not know that beyond the Berkeley Hills a new storm was brewing that would hammer Contra Costa and plunge the American West into turmoil. It all began when a farm in west Berkeley reported cows with disturbing symptoms. Then Shore Acres Dairy Farm in San Leandro discovered their cows had sore mouths, were slobbering and refused to eat. Pigs from Solano County at a nearby slaughterhouse were also sick. A scary diagnoses was finally confirmed. It was the highly virulent and dreaded hoof and mouth (Aftosa) disease. George Heeke, California Director of Agriculture placed Alameda and Solano counties under strict quarantine on February 22. The disease affects primarily cloven-hoofed animals like cows, pigs, sheep and deer. However many animals can be carriers including horses, dogs, coyotes, wildcats and birds. People can spread the germs on their shoes and clothing. In infected animals blisters and lesions appear on the mouth and tongue. Cows become dry and steer lose weight and become lame. Sores are present on the feet causing the animals to become lame. Mortality varies between 5% to nearly 40%. Dairy products and hides from infected animals can carry the germ to other regions. Occasionally people will become infected suffering unpleasant mouth and tongue blisters along with high fevers. But for humans mortality is low except for children in poor health. The accepted policy then and now is when an outbreak of hoof and mouth is discovered, the area of the disease is quarantined and all of its animals slaughtered. The states have agreed to enforce these measures along with the federal government. Costs of the executions, burials, guards and live stock compensations are usually shared equally between the states and federal government. By February 23rd, it became clear that the disease had spread to Solano, Napa, Alameda and Contra Costa counties. All these counties were now placed under quarantine. Despite reassurances from the authorities, panic began spreading through the state. On February 23rd Canada closed its borders to all imports of livestock, animal products, dogs and poultry from California, Nevada and Oregon. Hay, fodder and manure was included. On the 27th Colorado closed its borders to all California livestock. 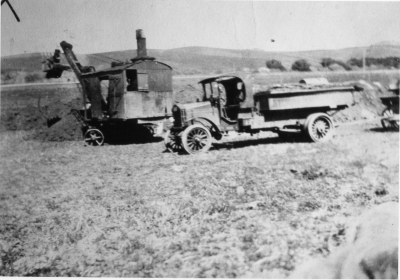 Four steam shovels worked around the clock digging deep ditches in the hills east of San Pablo. 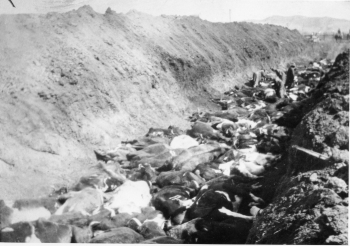 The first cattle herds were driven into the long ditches and killed by army troops. Near the junction of El Sobrante and San Pablo dam roads 1,100 cows were shot on the McMahon ranch. A burial pit in El Sobrante. About six miles southeast of Pinole on the Fernando ranch, another 750 were killed, covered with lime and dirt. Three hundred and sixty four cows were shot in a large pit one mile east of Rodeo. Ranchers who suffered major losses were S. J. Claey, George Breete, the Nunes brothers, George Mulligin and Jack McMahon. Many Contra Costa dairy herds were decimated including those from the Joe Costa dairy, Joe Porter and Antone Cardoza. Guards were stationed twenty four hours a day at all the burial sites ensuring that no one would steal the infected hides. Even more importantly they had to prevent predators from uncovering the bodies and spreading the disease. Gases in the dead cows would sometimes cause the bodies to explode uncovering the remains. In the rising panic there began hunting and poisoning campaigns aimed at eliminating coyotes and bobcats in Contra Costa. They were considered potential spreaders of the germs throughout the county. Dogs and cats not confined to their homes were also shot and poisoned. Experienced hunters were brought in to Contra Costa. Between Brentwood and Rodeo it was reported that a vigorous extermination campaign was carried out. Special sterilization stations were maintained on the main highways in the quarantine areas. Automobile tires were disinfected and at times the clothes of passengers were fumigated. Nevertheless by late March the disease had spread to Merced, Stanislaus and Tuolumne counties. With Los Angeles and San Francisco counties affected, two thirds of California's population was under quarantine. Travel restrictions meant that bootleggers found it difficult to deliver their products. Liquor supplies began drying up much to the dismay of some Californians. Outdoor events were canceled and hiking and camping discouraged. Only train travel was permitted into Yosemite National Park. A slaughter of the deer in the Sierras began as some were discovered to be infected. By the summer of 1925 over 22,000 deer had been killed. For awhile camping was banned in Sierra national forests. The forests remained under quarantine until June 1926, a year after the last infected deer was killed. In early April Canada banned shipments of cattle from all ofthe western United States. Colorado and Montana stopped the import of California fruits and vegetables as well animal products. Even California farm workers were prevented from entering Montana. On April 11, 1924 Arizona closed its border to all eastbound traffic from California. Soon 1500 motorists were jammed up impatiently waiting in the scorching desert heat to proceed east across Arizona. Only intervention by the federal government prevented potential bloodshed at the Needles- Yuma crossing into Arizona. Irrational fear had swept the nation and the world. Many countries banned most of California's agricultural products. A total of thirty six states did the same. Within California the uninfected counties even stopped accepting the agricultural products from Contra Costa and other quarantine areas. As the plague moved into the Central and then Imperial counties, the economic situation was becoming desperate. Responding to pleas from California's suffering butchers, experts repeated over and over again that people could not catch the disease by eating meat. Fruits and vegetables were safe as well. Few believed them. President Coolidge finally recognized the escalating seriousness of the situation. The Department of Agriculture agreed to inspect and certify the fruits and vegetables from California and Contra Costa for export to other states. The Republican President, Coolidge, instructed the Democratic governor, George Hunt, to lift Arizona's blockade. After several false starts and foot dragging, the Arizona - California border was reopened. California's Republican governor, Richardson, appeared politically paralyzed during this crisis as opposition to live stock slaughter from ranchers and dairy men grew. Calls for a special session of the legislature gathered strength. On their own the state agricultural agents proceeded with the quarantines and the mass killing of live stock. They were aided by the federal government who made them temporary agents of the Agricultural Department operating under drastic federal epidemic procedures established in 1917 after a national hoof and mouth epidemic in 1914-16. (THE ASSOCIATED PRESS) MARTINEZ, Feb. 27.-Two men were given sentences of six months in jail and one was assessed a fine of $50 for the first arrests and conviction under the state quarantine law restricting the movement of livestock in connection with the campaign being waged against the hoof and mouth disease. Both men had moved livestock along the highway in Contra Costa County. Putting aside the overreaction of states and foreign governments, by early April the contagion was beginning to subside. Strict quarantines and the immediate killing of all infected or suspected infected animals proved effective. By June most of the quarantine areas in the state were lifted. Although occasional outbreaks continued into October, the worst was over. From 1924 to 1925, 58,791 cattle, 21,195 hogs, 28,382 sheep, 1,391 goats, and 22,214 deer were slaughtered. Losses ran into the millions. The economy of the state was depressed. In Contra Costa the herds in the San Ramon and Pinole valleys were particularly hard hit. Estimates place the loss in Contra Costa as high as 10,000 animals. One farmer lost 3,000 pigs. Partial reimbursement was offered. The state and federal governments agreed to split the cost of the appraised value ofthe animals destroyed. 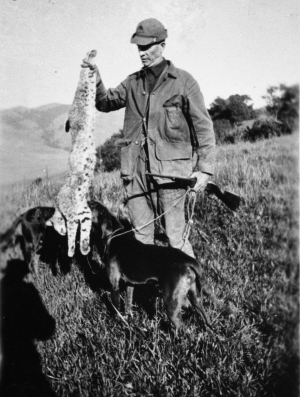 S. J. Claeys of Rodeo was hired to appraise the value of all the animals destroyed in Contra Costa. His total appraised value was $233,764. An animal's higher pedigree or breeding was not considered in the appraisal. The dollar amount only reflected of the value of the animal's meat. Whatever else you can say, the people of Contra Costa were tough. They had weathered bad times before. Even the temporary destruction of Contra Costa's livestock did not dampen the spirit of her ranchers and farmers. The herds were quickly rebuilt. In the 1920's the booster spirit was still alive and well and Harry Hammond, editor ofthe Byron Times, endlessly promoted the wonders of Contra Costa to the rest ofthe world. During the next 15 years in good times and bad, the population doubled. Orchards of cherries, peaches and other fruits continued to spread. Vineyards were planted and housing tracts started. In time this catastrophe was forgotten except in old newspapers and in the memories of the few who had lost it all.